DOCTOR STRANGE OPENS IN THE U.S. ON THE 4th OF NOVEMBER AND IN MALAYSIA ON THE 27th OF OCTOBER. TO FIND OUT WHEN IT OPENS NEAR YOU CLICK HERE. Doctor Strange, part of Marvel third phase in their cinematic universe and the 14th film that features a brand new character that unless you've been a fan of Marvel you probably have no idea who he is. But you've probably seen all the trailers by now so you at least know he's a hotshot surgeon who gets into an accident and loses his ability to practise his skills. Depressed and angry at his condition and the fact that modern science can't help his hands return to the way they were he goes in search of other solutions. Solutions that reveal to him a reality he had no idea existed and new challenges and foes. This movie isn't the first movie with Doctor Strange of course, back in 1978 there was a live-action adaptation of the comic book that was made for TV. In that version Strange was a psychiatrist. After that live-action TV movie which Stan Lee was quite proud of, there have been attempts to make a Doctor Strange movie since 1986. 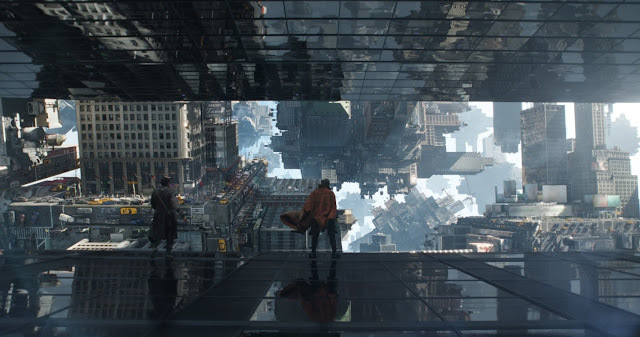 A lot of writers and directors have been tied to a variety of different Doctor Strange projects with a number of different studios but nothing materialized until of course Marvel regained control of the movie rights for it's comic book characters. 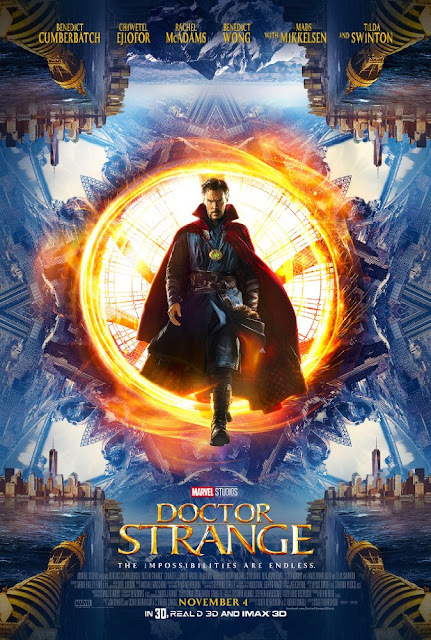 And even then when this particular production began to gain traction there were many, many actors rumoured to be shortlisted for the role of Doctor Strange including Tom Hardy, Jared Leto, Keanu Reeves, Joaquin Phoenix, Édgar Ramírez, Ethan Hawke, Oscar Isaac, Ewan McGregor, Matthew McConaughey, Jake Gyllenhaal, Colin Farrell, and even Ryan Gosling. Doctor Strange first appeared in an issue of Strange Tales #110 dated July 1963. Created by Steve Ditko who wanted to bring to the Marvel Universe not only a new character but someone who was different, someone who dealt in the mystical arts and who dealt with different realities, the multiverse. Under the guidance of the Ancient One whose trust he gains after revealing the betrayal of Baron Mordo, Strange soon becomes one of the strongest magicians in the universe. He fights enemies with the aid of the Eye of Agamotto and his recognizable Cloak of Levitation. His greatest foe is Dormammu, a warlord from an alternate dimension called the "Dark Dimension"
That bit up there is from the comics of course. For the movie it's somewhat similar. Strange (Benedict Cumberbatch) is a doctor and he does get into an accident that renders his hands useless. He does waste all his money trying to find a fix for it but as each method and solution fails he slowly loses faith in modern medicine. He comes to hear about a man who learns to walk again after being diagnosed with a broken back. He searches for the man and gets a simple answer, Kamar Taj. In the comic book Strange learns of a mystical place from two sailors talking by the dock. In Kathmandu as he wanders around asking everyone he meets about Kamar Taj he is stopped by three men who aim to rob him. He tries to fight back but his hands fail him again but just then a man comes to rescue him and takes him to the place he's been looking for. The man's name is Mordo (Chiwetel Ejiofor). Mordo takes him to the Ancient One (Tilda Swinton). 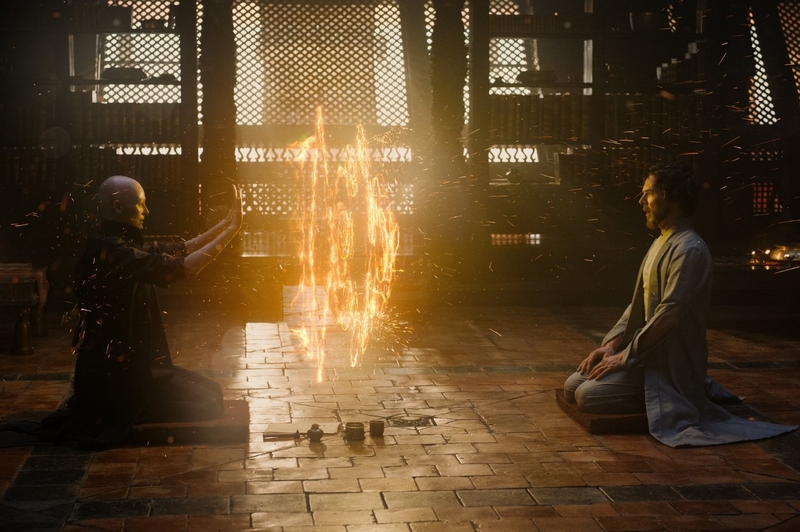 Their first encounter opens reveals to Strange amazing things but the Ancient One refuses to take him under her tutelage but with a little convincing from Mordo and Strange hanging around outside for five days, the Ancient One changes her mind. Soon Strange is reading everything in the library and harassing Wong (Benedict Wong), the librarian. It is while perusing one of the books in the library that he learns of Kaecilius (Mads Mikkelsen), a former student of the Ancient One who is now intent on destroying the three sanctum sanctorums that protect the earth from otherwordly enemies in order to allow a creature named Dormammu to enter our reality. Kaecilius believes Dormammu will bestow upon him and his followers eternal life. This is quite different from what is told in the comics but when you watch the movie and stay till the very end including the two end credit scenes you'll find out something interesting, or something that'll lead to what the next Doctor Strange movie maybe about. Anyway here's a few things I enjoyed. Let's start with the story, it's the same familiar formula. You meet the main character, you get a sense of their personality. They get into a situation that forces them to change, to re-analyze their situation, their world. They go to a learning phase and soon after they meet the enemy. And like other Marverlmain characters there's a love interest, in this case it's Dr. Christine Palmer (Rachel McAdams) and like Stark and Potts it's a rather tenuous relationship that they have because his ego gets in the way. You might think that because it's the same formula that it's predictable and it is but there's nothing wrong with it. The story flows beautifully. You're given just enough without being overwhelmed by too much details nor are you bombarded with endless detailed expositions explaining everything. You don't need to know much about Doctor Strange to enjoy watching Doctor Strange. The cast. I've always liked Benedict Cumberbatch and think that he's capable of taking on any role and making it his own. His characterization of Doctor Strange is perfect. Not for a moment do you think or notice that he's an english actor trying to sound american or that his hand gestures look fake while trying to conjure up spells. Then there's Tilda Swinton, sure there were a lot of negative press when it was announced that a white woman was to play an old asian man but for this movie the Ancient One was never asian, she's celtic. And several hundreds if not thousands of years old. And she does a brilliant job of playing a wizened practitioner of the mystic arts, but there's more to her. Something unexpected and as you watch her it shows. Only at the end do you find out what she's hiding. Mordo played by Chiwetel Ejiofor was also good. His transition from a loyal student and when he learns of the Ancient One's secret is palpable. As is Kaecilius, you believe that he truly is evil until that one scene where you realize why he's doing what he's doing. What you see on the screen. I watched Doctor Strange in IMAX 3D and man was it worth the ticket price. 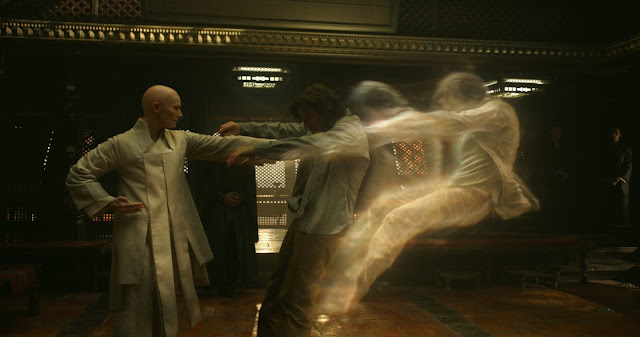 I read somewhere that the director Scott Derrickson had almost an hour or more of footage shot or formatted originally for IMAX 3D and it shows. The moment that anyone begins to cast a spell it really takes you to a whole new visual experiences. The scenes were truly mind bending and at one point made me feel a little vertigo. The little references to previous Marvel films. You spot familiar landmarks. There's a little reference to Rhodey. All these little references tell you that Strange lives in the same reality as all the other Marvel superheroes of past Marvel movies but it doesn't go any further. This is a movie about Doctor Strange. You enjoy the little references and that's that. Overall, I thought Doctor Strange was an amazing film. Everything seemed to fit perfectly together. The story was engaging and entertaining with a perfect mix of drama, humour, action and more. The actors were brilliant in their respective roles. The music a lovely complement to what was on screen. The visual were unlike anything you have ever seen put into one movie. You may have seen it in bits and pieces in other movies but not all together at once and even though you might think it would turn out to be a mess Derrickson did a brilliant job of making it work. And making it look incredible. But unlike other some movies like for example Guardians of the Galaxy which at the end left me feeling excited, satisfied and wanting more, Doctor Strange just left me wanting more. I wanted to see more, know what is next is store for the good Doctor. That's a good thing. I was impressed with Doctor Strange, I'm giving it a solid 4.5 out of 5. I can't wait to see Cumberbatch back as Strange and hopefully in the same hands as the people that made this one.